On day two of the NETmundial, as participants dive deep into the process of negotiating an “outcome document” — the poorly named but critical output of the global meeting on Internet governance — many are questioning what the document actually seeks to achieve. After all, this is a one-off event, with no legal framework to hold anyone accountable to its outcomes. So what exactly are we all doing here? In the months leading up to the meeting, nearly 200 groups and individuals from all sectors of society submitted recommendations for a set of principles and a “roadmap” for the global Internet governance process. Shortly before the meeting began, a draft of the outcome document, which attempted to aggregate these submissions, was released. Now that the meeting has actually begun, the process is heating up. The discussion has been split into a series of panels intended to review sections of the document, both a set of principles and a road map for the Internet. Participants can give their views in two-minute segments, with microphones allocated for each representative group – civil society, academia/technical community, government and private sector. Remote participation from hubs around the world is being facilitated by streaming video, with questions and remarks coming from as far as Hong Kong, Tunisia, and Nigeria. A group of remote participants from India chimed in with questions as late as 4:00 am on Tuesday. While the long stream of UN-style speeches that began the meeting were the subject of some criticism by participants on Twitter, the process itself has been relatively well-received. One group of participants, all government representatives, complained that their submissions had not been incorporated in the outcome document, though panel members suggested this was due to procedural issues such as late submission rather than any purposeful exclusion. 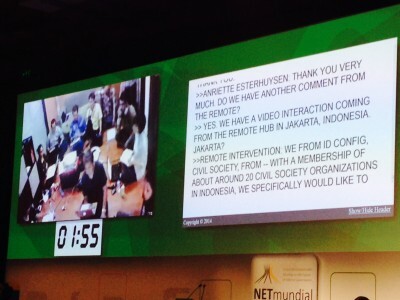 Everyone here at the meeting is feeling heavily time-constrained — accomplishing the goals of NETmundial in two days is a tall order. There has also been significant debate as to what should be done with the outcome document — suggestions so far include sending it before the Internet Governance Forum, to be held in Turkey this September, or for Brazilian President Dilma Rousseff to bring it before the UN General Assembly. Support from either forum would be a strong statement in favor of the legitimacy of the document, particularly for those concerned about sovereignty and multilateralism, but is by no means guaranteed. If the process of negotiating the document is widely accepted, it will have another form of legitimacy, one more in line with the spirit of a multistakeholder Internet. It will have been created through consensus by a wide ranging group of internet visionaries, civil society advocates, government and private sector leaders. Although this cannot guarantee concrete action on the part of governments, it should count for something.